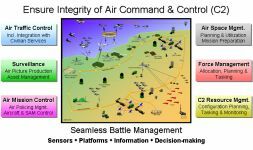 The NATO Air Command And Control System (ACCS) is intended to combine, and automate, at the tactical level the planning and tasking and execution of all air operations. 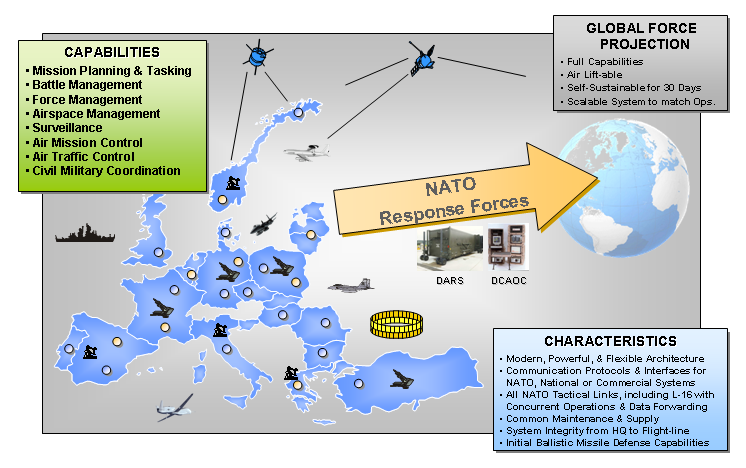 When operational, the ACCS will provide a unified air command and control system, enabling NATO’s European nations (including new Alliance members) to seamlessly manage all types of air operations over their territory, and beyond. NATO members will be able to integrate their air traffic control, surveillance, air mission control, airspace management and force management functions. ACCS will incorporate the most modern technologies, and will make full use of up-to-date data link communications. 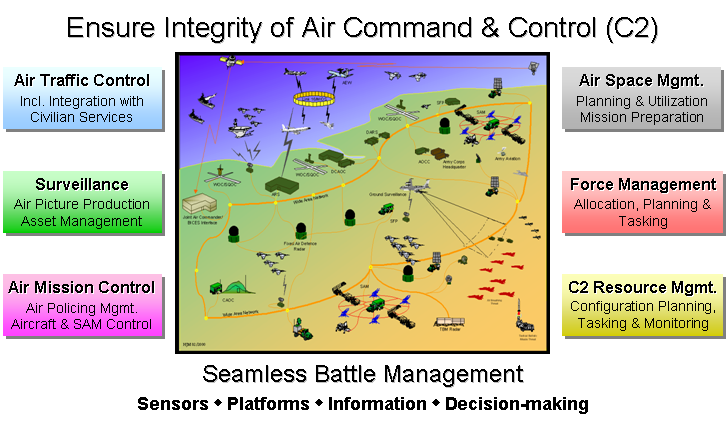 Through its open architecture, the system is already evolving to meet emerging operational requirements such as those associated with theatre missile defence, and it will be able to adapt to a changing operational environment such as network centric warfare. Completion of the whole ACCS programme, comprising the provision of hardware, software and communications, but excluding the acquisition of sensors, will cost NATO and the nations approximately 1.5 billion euros. 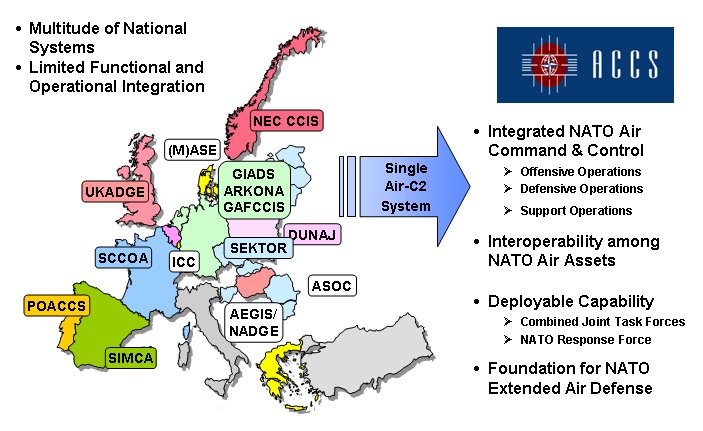 The system was conceived in the 1980’s to replace existing air defence systems such as NADGE and GEADGE, but it wasn’t until 1992 that the North Atlantic Council agreed to the initial implementation of ACCS to a first level of operational capability in both static and deployable configurations. The initial NATO contract, worth at the time some US $500M, was signed in 1999 with Air Command Systems International (ACSI), a French-registered company (now based in Massy near Paris) formed by two shareholders, Raytheon of the USA and Thomson-CSF (now THALES) of France. The contract provides for the development and testing of the ACCS system core software and hardware, and initial installation will occur in validation sites in Belgium, France, Germany and Italy which have each signed separate contracts with ACSI. Following successful testing and validation, replication of the software will occur in sites throughout NATO Europe. The programme schedule, originally planned for 69 months, has been extended by approximately one year to accommodate modernisation of the design architecture and changes to the Human Machine Interface. In December 2003, the programme successfully concluded its software Critical Design Review, and formally moved into the software development phase, although some 40% of the software had already been coded through parallel activities. Testing will begin this year, with validation planned to begin in the second half of 2005 and to last about a year before the system will be ready for operational use. ACCS will be fielded at the planning and tasking level in Combined Air Operations Centres (CAOC), supporting the Joint Force Air Component Commander in exercising OPCON over his subordinate forces. ACCS will be fielded at the execution level in control centres (using the generic acronym ARS) that will provide facilities for aircraft control and production and dissemination of the Joint Environment Picture. At present, NATO and the nations have requirements for 5 static and 2 deployable CAOCs, while 18 static and 2 deployable ARS are also planned. Which NATO bodies play a central role in implementing this policy? NATO’s contract with ACSI is managed by the NATO ACCS Management Agency (NACMA) in Brussels. NACMA is the procurement and implementing body of the NATO ACCS Management Organisation (NACMO). Within its primary function as a system acquisition agency, NACMA’s tasks include; the central planning, system engineering, implementation and configuration management for the ACCS programme, and ensuring ACCS system integrity, integration and interoperability. The Agency employs just over 100 personnel of the NATO International Staff. For the last 7 years, the Agency’s General Manager has been Lt Gen (Ret) André Nicolau who, prior to his appointment, was the Général Commandant la Défense Aérienne et les Opérations Aériennes in the French Air Force. Gen Nicolau retired from NATO on 1 August 2004 and was replaced by IGA François Naville, previously the Co-Vice Chairman of the NATO Consultation, Command and Control Board (NC3B) in Brussels.